Pulchellus, pulchela, pulchellum mean 'somewhat beautiful' or 'pretty'. Clump-forming Allium pulchellum is native to the Mediterranean region and is an excellent cut flower. "A lovely pure white form of Allium pulchellum carinatum. Quite slow to increase. Lovely addition to the rockery. Height 12 inches" from RV Roger. Looks good growing through Artemesia schmidtiana 'Nana'. Plant in containers or in drifts in the rock garden or border with Heuchera 'Dale's Strain', Sedum 'Oktoberfest' and Talinum calycinum. Plant at 4 inch (10 cms) depth with an inch (2.5cms) of fine grit under them for drainage and 12 inches apart. Never plant at perfectly measured distances apart as this looks artificial - plant in clumps of 5, 7 or 9 in a staggered group so that they look more natural when they flower. 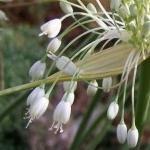 "Allium fireworks, pendulous allium bulbs with around 50 to 100 bell shaped flowers, the flowers may be dainty but planted en masse they look stunning. Allium Graceful Beauty" from Peter Nyssen. "Strong flower stems carry graceful loose heads of icy white, bell-shaped flowers, just like an exploding firework display, for two months or more. If you are lucky, in well-drained soil, it will gently self sow and form handsome drifts. Sow seeds at any time covering them with compost or grit 5mm deep, keeping the seed pot in a cool, well-lit spot outdoors. Artificial heat is not needed and can prevent germination so be very patient as many species will only germinate in the spring after chilling or freezing in the moist seed tray in the winter. Grow on individual seedlings in small pots until of sufficient size to be potted on or planted out into the open ground." from Plant World Seeds who sell and ship globally. 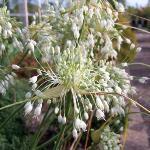 "We hope that Allium carinatum ssp pulchellum 'Album' will find a special place in your rockery. (Try in association with silvery artemisias)..
As colour is a very important element in a landscape, it is essential to know how to use it. Here are some ideas that will help you grasp the subtleties of colour composition. To achieve a harmonious combination, we use shades that are close to each other on the colour wheel. If you wish to create contrasts, you associate opposite colours. The strongest contrasts are obtained by combining exactly opposite colours, such as red and green, blue and orange, yellow and purple. Remember that nature is an excellent source of inspiration when you come to choose colours in the garden. Why not, for instance, try to recreate the atmosphere of a place you have visited and that you particularly enjoyed? Remind yourself that what is acceptable or not in a colour composition is as personal a matter as how you decorate a room. Don’t be frightened of experimenting, it’s by far the best way to find out what suits you best. You will then be able to create unexpected effects that you would never have discovered through a purely theoretical approach. Warm colours include reds, oranges, yellows, pinks and deep mauves. Cold colours include blues, greens, whites and pale pinks. • while the cold colours are calmer. 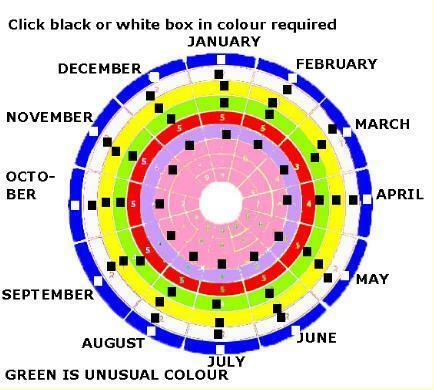 This classification is basic but it is very useful when looking at how to play with colours in a garden. Using our advanced search engine, you can make a colour selection of perennials from our catalogue: blue, yellow, pink, etc. The Right Plant in the Right Place, advanced search"
Most of the seeds in our Germination Guide have been offered from time to time in our annual Seed Exchange (Seedex) from Ontario Rock Garden & Hardy Plant Society in the USA.